Prime Minister's aspiration to turn the country into a top investment destination has got off to a positive start, with India now ranked by the World Bank at 130 of 189 countries on "Ease of Doing Business." That is up 12 places from its original ranking last year and four places from its rank on a revised list. 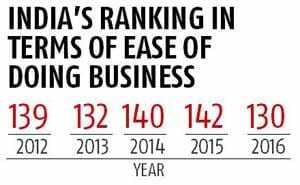 1) India was ranked 142 by the World Bank in 2015 on ease of doing business and later its rank was revised to 134 based on a new methodology. 2) PM Modi has said that he wants India to be among the top 50 countries on the list compiled each year by the World Bank in its report on doing business. 3) China is now ranked 84, moving up six spots. Singapore, New Zealand and Denmark occupied the first three spots in the list while South Sudan, Libya and Eritrea were ranked at the bottom three. 4) Terming the improvement in India's ranking a "remarkable achievement", World Bank Chief Economist Kaushik Basu said, "Going from 142 in the world to 130, as India has done, is very good sign. It gives a good signal about the way things are moving in India." Mr Basu added that India can be in the top 100 countries next year if it continues with the set of planned economic reforms, including the crucial goods and services tax (GST). 5) The rankings are based on 10 indicators such as how easy it is to start a business and sometimes form the basis of foreign investments in a country. According to the new report, it takes 29 days to start a business in India now; it took 127 days in 2004. 6) In May 2015, the government eliminated the minimum capital requirement to start a business and also ended the requirement to obtain a certificate to commence business operations, which helped it improve its rankings, the World Bank said. 7) The biggest improvement was seen in the area of providing power to businesses, where India's ranking improved from 99 in 2015 to 70 in 2016, the World Bank said. "Now companies can get connected to the grid, and get on with their business, 14 days sooner than before," the report said. 8) The World Bank noted that India recorded the biggest increase in the distance to frontier (a measure of a country's absolute performance) score in South Asia since 2004. "More reforms are ongoing - in starting a business and other areas measured by Doing Business - though the full effects have yet to be felt," it said. 9) India is ranked 8th in terms of protecting minority investors, 42nd in getting credit, 70th in getting electricity, but scores poorly in dealing with construction permit with a rank of 183 out of 189 countries. Enforcing contract (rank 178), paying taxes (rank 157), resolving insolvency (rank 136) are other areas where India ranks poorly. The ease of doing business index is an index created by the World Bank Group.Higher rankings (a low numerical value) indicate better, usually simpler, regulations for businesses and stronger protections of property rights.